What's the best way to honour Luke the Evangelist and Physician on his Feast Day today? Revelation, namely the winged bull or ox. If eating beef and attending a 'red-letter' day church service is all we do to honour Luke I think we miss the point. I suggest that in remembering Luke we need to hear and share his message. Luke's message in his gospel and its sequel the Acts of the Apostles is the message of Jesus, good news for all people, including people seen by others as outsiders. I love this sonnet for Luke by Malcolm Guite, from his collection 'Sounding the Seasons'. I reproduce the words in full below or you can hear him read it here. Your post has encouraged me to read further about St.Luke. What is a 'red letter' day church service? A red letter day is any date of special significance. It's not an official name - just a nickname really. In the Christian Calendar Festival and Principal Holy Days e.g. Christmas, Easter, Saints Days are often printed in red type in calendar lists, as opposed to black for ordinary days. 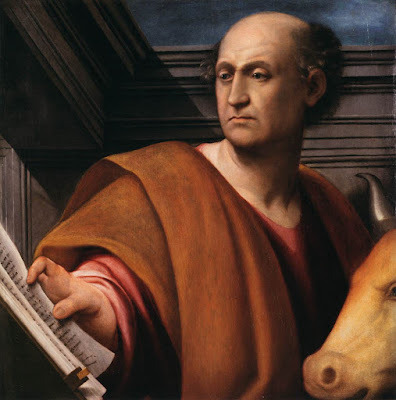 'Luke the Evangelist' is a Feast Day in the Anglican Church so is a 'red-letter' day. The readings etc in the service will be those appropriate for the feast. I could just as well have said 'attend a church service on this saint's day'. I hope that answers your question.